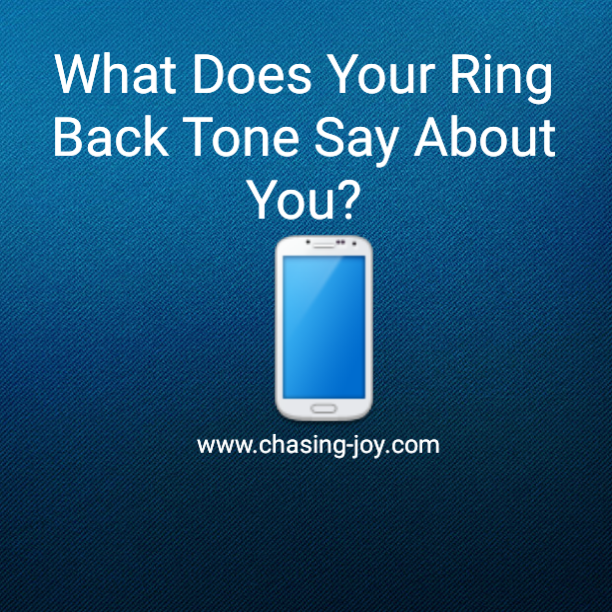 What Does Your Ring Back Tone Say About You? people to remember when they think of me or Chasing Joy. when you are representing your blog, business, or organization in public. It is important that your represent your brand accurately. impression that is inconsistent with how you’d like to be perceived. I hear when I call your phone??? I don't have a ringback tone at this time. I get what you are saying though. People get an impression of you, whether right or wrong, based on what they see and hear. I don't have a ring back tone on my phone. I don't think I want to add one back either. My ringtone is Olivia Pope's ring tone LOL or the factory one. I havent had a song ringtone in years! Its better that way because phones go off in the most inappropriate times…most people I know stick to their default iphone ringtone which is safe! I used to play with my ring tones, now I pretty much just leave the factory one. Though that being said, most time I just have it on vibrate anyhow – especially in public. I never think too much about my ring tone. I usually just leave it to the factory set one. I do not have a ring back tone on my phone. My kids use them and love it. I will have to add one to my phone. I hadn't considered how those little things could make such a statement. My ringtone is pretty generic but it's a chance to make an impression. I've just used the default ringtone for years! I hope that doesn't reflect poorly on me! I wonder if I'm boring because my ring tone is totally standard to the phone. Maybe I need to spice things up a bit! My ring tone is a ringing phone. Guess I was so programmed to answer a ringing phone – that when I had a music tone I never answered it. What a interesting post. I never thought about what my ring tone might say about me. My current one is Red Solo Cup. I always find it interesting what people choose for their ringtones. I have animal noises all the way to babies crying. I use to have a custom ring tone but lately I just pick one that comes with the phone. My ringtone is whatever was preset. I remember it used to be "the phone, the phone is ringing" song from Wonder Pets. Ha, Shell! I was just singing that song yesterday. 🙂 To the fly boat! I just got a new phone and my ringtone sounds like a lullaby. I need to change it! This is a great article! I've never thought about what my ringtone might say about me. Thanks a lot! When I was younger I had fun ringtones but now its probably the one that was on the phone when I bought it. I live by the motto that actions speak louder than words. Everything we do and represent is part of our branding! I just got a new phone and I am not sure what ring tone my husband put on it. I need to check that out. I have not received any calls on it yet. I do agree with you, it needs to represent who you are. I have never changed my ringtone. Whatever was programmed in the phone is what I use. I do hear some adults with some pretty interesting ring tones. It makes you take a step back especially when the ring tone have language that children should not be hearing. you would hear the theme from Downton Abbey. as a children's blogger, i've tried having children's music as my ring tone but it wasnt quite right. The downton abbey town hopefully shows people that i have a brain and i watch PBS. and i'm smrt. I wouldn't even share my iTunes list b/c I am so eclectic with my taste. I can't imagine the song of the moment going off while I am in a professional setting. Or something crazy while in chruch. Interesting… I have various sounds on my phone … I haven't used songs in a good bit … I have specific ring tones for different people, if you are the standard ring tone set up I will not pick up as quickly. I use to have Beethoven as one of my ring tones back in the day … I was in love with Fur Elise. DJrelAt7 I had not thought much at all about what people hear when they call me until he was dialing the number and I realized how relieved I felt know it would only be classical music in his hear. I agree with the idea of first impressions being lasting impressions! We would hear such random songs (some profane in nature) when we contacted prospective students to the university and it was definitely creating a negative impression. My current ringtones are based on my affiliation with the caller.. my work colleagues (the university's fight song), my best friends (I'll be there for you– Friends theme song), my family "Lionel Richie: I call it love), my someone special… "It's in His Kiss".. I like the idea of personalized ring tones. My phone is on silent most of the time.